I watched this drama following the recommendation of a friend, whose judgment in terms of good dramas I've come to trust completely. And, not surprisingly, I loved it. It's not well known, possibly because it's not studded with the usual idols fangirls swoon about. Sad, because it is wonderfully acted and incredibly original, from the surprising beginning to the absolutely unexpected ending. The pace is slow, which can deter some, but I personally found it perfect, with the exception of a couple of instances by the middle. The symbolism of it captivated me from minute one, and I think this is the most fitting title of a drama ever. This dorama is a collection of memorable lines and even more unforgettable characters. Takizawa Hideaki and Fukada Kyoko do a splendid job in portraying their characters: the first leads the viewer where he wants, once liking him, another time hating him, then again fearing him or feel compassion; she, on the other hand, is either love or hate. 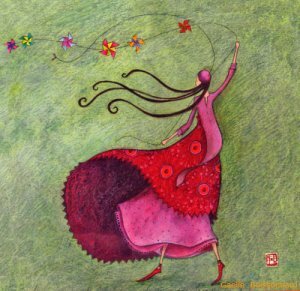 I usually am deeply annoyed by girly girls all cuteness, pink and seeming candour, but she is so artless, even in her machinations, that I found her adorable. This is not a pretty girl playing cute: cute is her essence, and even in her apparent silliness, there's an unexpected depth of thought. But who really did it for me are the secondary characters, played by Yosuke Kubozuka and Uchiyama Rina. Terrific acting skills and wonderful character development by both. Not that I doubted it: I still have to see Kubozuka playing a part without doing an outstanding job. And Uchiyama is downright brilliant in this. The music is another very strong point. Without being a fan of Abba myself, I thought the soundtrack was chosen with sense and logic. I like it when single music pieces identify a single character, to the point you know who's going to be portrayed even though you close your eyes. In conclusion: I watched this thanks to a Perfect recommendation; I hope to be able to pass on a little of that with my review. This is the first time ever I drop a drama because it is too good. It sounds like a paradox, so I'll do my best to clarify my reasons. As I said, this is an amazing drama. It's based upon a true story, which explains why I find it hard to rate the plot. The way it is narrated is quite unique: it uses the technique of flash forwards, making the viewer aware from the very beginning of the destiny of basically each character. This style can be very confusing at the beginning, to the point viewers may think they are watching the wrong episode; once established, though, it becomes highly intriguing, and one of the strong points of this drama. Instead of depriving the viewer of the thrill to know what's going to happen, this method excite the curiosity to find out HOW it happened, and why. If there were a separate rate for direction and editing, I would give them both a 10 without hesitation. The acting is stellar. I'd go as far as to say that it's more suitable to an essay movie than a television drama. As a matter of fact, this is by the same director of the 2001 movie. The cast is so convincing and the acting so intense, one truly believes to be watching the real story, instead of a screen revisitation of it. Characters' changes are portrayed subtly and slowly, giving the viewer time to understand and empathize. I found myself talking to the screen more than once, praying one or the other of the characters would not make that choice which, I knew, would change the course of their lives forever. The music is poignant and moving. Combined with the beautiful photography and the outstanding acting, it brought me more than once to the brink of tears - and I don't cry easily, if ever. So why did I drop it? Because I was empathizing too much, and it pained me. By the middle I was so involved in this story I would feel restless and anxious. Mind you, the show has got many sweet, touching and funny moments. I just couldn't take all the emotions anymore. It is my intention to go back to this drama in future, maybe after a strong dose of surreal/hilarious/ridiculous shows, like a camel storing water before a long journey. Hence the very high re-watch value. This drama promises the viewers something and gives them something else. It promises to be a fantasy drama and it ends up being a sort of religious/philosophical brick-Ã -brack. Fantasy requires a dream-like atmosphere - which is lacking here - and is built upon moments of true respite, be it a healthy laugh or a funny, surreal, fast paced adventure. This show has nothing of the sort to offer. It promises to give us a reason as to why these 49 days were given to that particular character and it ends up solving a corporate conspiracy. It promises romance and it gives us friendship - which would be just fine, if only one wouldn't expect something different. It goes as far as to close up with a supposed lesson, which I personally find pretentious. Because, unless you are 14 and have never read or heard of "letting go of the deaths and live your life to the fullest", there is nothing new to be learnt here. I would have gladly accepted this as the main theme of the drama if they had chosen to narrate it in a symbolic way, or a unique direction. When content is trite, style has to take over, or the impression is we are taught a very obvious lesson. And while direction and photography were both good, they chose the path of realism, in direct contrast with the plot. I was disappointed with the acting too. With the notable exception of Scheduler - and even he lost his spark in the last episodes - all the others felt contrived and apathetic. Mostly the main female lead, whose broody expression and slow pace became an exaggerated repetition already on episode 5. Mind you, I'm not criticizing the actress: for all I know, this could be - and probably was - a direction choice. The music was good, I thought it soundtracked each episode with due discretion, never overpowering the scene. Re-watch value: 1. Because once you are deprived of the thrill to know what's going to happen to these characters, the charm of it evaporates like puddles on a hot day. "This is my love story". The movie opens up with this declaration, uttered in background narration by the main character while he's scorned and targeted by a players-filled basketball court. And it isn't only the rival team watching him with contempt: his own teammates are shouting the loudest. "This is my love story", repeats Sugihara while he escapes from the police or is beaten by his father. The contrast between the narration and the scene shown on screen gives us the key to the reading of the whole film, which is about finding ones place between love and hate, belonging and distancing, caring and detachment. It's the story of a young man who has to show the world he doesn't give a dime while inside he's yearning for a sense of belonging. GO is a wonderfully dramatic movie, one that deals with a cruel reality of discrimination. It's the journey of a guy who struggles to find his place on the planet. But don't be fooled by the surface: the director highlights the Japanese prejudices and the Korean stubborn obtuseness in equal measure. To each their own share. And in the middle of this, there's Sugihara, who looks like a Japanese, talks like a Japanese, was born in Japan and is not recognized as one. His part is superbly acted: Yosuke Kubozuka is so convincing one can't help falling for him despite his murderous glances and his rebellious spirit. So how is this a love story? It is such on multiple levels: there's love for the friends, love for a father shown with fists, love for a country - or 2 - and love for a girl. The music fits the pace beautifully, never overpowering the scenes. Overall an emotion-filled movie, superb in acting, direction, plot and photography. To be avoided if you're looking for a light watch. A must if you like thought-provoking films. This is possibly the weirdest and most surprising dorama I've ever come across. Nothing is what is expected, or what it seems. It's just as hard to define its genre, because while it could be listed as a science fiction drama, the fantasy part is just a device to make a very human, touching and very present message come across: are we really capable of cherishing our lives? Do we truly appreciate all the little and big things thrown onto our path or do we give them for granted? Were I to base the overall rating only on how much I liked it, I would give it a 10. But it's undeniable that it doesn't deserve it on the cinematographic level: the shooting quality is average at best, it reminded me of those catastrophe movies from the 70ies, like Poseidon, or Empire of the Ants, often naive, with some ludicrous special effects. And it certainly does not shine for its photography. The music goes from ordinary to completely random. But characterization, dialogues and acting make up in heaps for whatever flaw. If you have read The Lord of The Flies by William Golding, this drama may remind you of it. Mix it with the most classical concept of Carpe Diem - seize the day - and you have Long Love Letter. Kubozuka Yousuke is adorable here, at times childishly clumsy, at others emotionally intense. But it's Takako Tokiwa who really steals the screen, her character being the epitome of strength of will, sweetness and courage. In fact, this drama is acutely feminine, like mother Earth herself. The kids play their part very well, one ends up liking a quite stony Yamashita Tomohisa too. I adored the ending. It makes this into one of those dramas one is emotionally compelled to talk about with someone, share opinions and questions. Like it or not, it doesn't leave you untouched. So, by now you have 2 choices: decide that both the drama and the reviewer are deranged and leave it be, or watch it. The only way to enjoy this is by erasing from your memory manga, anime, Japanese or Korean live-actions and simply watch this drama as though it were a completely new story, only with faces you've already seen and names already heard. The constant comparisons won't help; on the contrary, they'll spoil the fun. All in all, I DID enjoy this second season of Meteor Garden. The acting of all has improved tremendously, and so are photography, direction and characterization. Meizuo and Ximen's side stories are addressed and completed, something I thought was sadly lacking elsewhere. Shan Cai grows into a truly likable character and the second female lead is, for once, a delicious person, instead of the usual viper-like, scheming character. So refreshing! Honestly, I've had enough of girls portrayed as if they were incapable of true friendhip or generosity and who seem to live only to target the guy of their dreams. In this sense, this second season is way more romantic and realistic than many other adaptations. It has some dragging parts, mostly when the whole plot is compared in length to the pretty rushed ending, but as a counterpart to this, some details are truly satisfying (I can't elaborate this unless I spoil the end). Overall, I am convinced this drama is much better than what's usually expected and deserves a try. This drama already had a very good review, one that doesn't need to be expanded. The reason why I write one is because I loved this show and wish to share the joy, so to speak. I believe the best trait of this drama is in its script. Eriko Kitagawa - the screenwriter - does not disappoint. It's a collection of memorable, beautiful quotes, whether about love, friendship, dreams or fears for the future. They make you pause and think. And the screentime given to this disparate group of friends can really make your day, so universal it is in the world of friendship, be it in Japan, America, Europe or elsewhere. Change the names and perhaps the face features, and you'll be reminded of your own experiences. It's truly difficult not to fall in love with Sae and Kai, so sweet is their love story, but it's just as hard not to laugh, dispair or rejoice with all the other characters. Shibasaki Kou does such a wonderful job here, one soon forgets she has lost her hearing and can almost "hear" her talk. In short: I can't imagine anyone being disappointed by this drama. I stumbled upon this little jewel of a drama while following the filmography of Hiroshi Tamaki, the actor who basically introduced me to Asian dramas. Soon enough, I found myself forgetting about Tamaki-san, caught in the whirlwind of this surprising, thrilling, daring plot. This is usually referred to as a romantic comedy, but the definition is not really accurate. It is romantic inasmuch as it deals with love, but it's neither cute nor lacy/flowery/traditionally romantic. And although it has numerous comedic situations and dialogues, it touches serious issues, leaving their final verdict suspended, making the viewer be the judge. The cast is brilliant. Every character comes to life and has a wonderful screen presence. None is either completely good or bad, though. They're over the top, at times obnoxious, often surreal, always human. And because the game they are involved with requires them to interact with one another in turn, each time a different side to each character is unveiled. It's an adult drama. Not because it shows anything improper, but because it deals with adult feelings, failures, expectations and needs. The music serves its purpose brilliantly, moving at the same rhythm with the plot. Definitely a must see, in my book. You are probably asking yourself how I came up with an overall 7 after ranking all the rest so low. Fact is, for once I've decided to write a review which is very personal and not at all objective. It's based upon the emotions it gave me, not the cinematographic quality of the drama. Also, I think it's necessary to say that among the 3 versions of the same story, this was the last I watched, despite its being the first live-action based on the popular manga. And while I consider the Japanese version the best one regarding acting and music and the Korean one better in terms of photography, colours and characterization, I'm ready to face criticism and admit that the Taiwanese version was the most satisfying to me on a romantic level. The chemistry between Shan Cai and Dao Ming Si is what makes this into a worth watching show. For the first time, I was not rooting for the heroine to end up with the second lead, but for the main couple to finally be together. While watching hana Yori Dango and Boys Before Flowers I found myself constantly thinking: throw that arrogant brat away and choose Rui, or Ji Hoo! I ascribe this to the actors and the way their interactions were portrayed. While Shan Cai can be annoying at times, she is a consistent character and once she finally realizes who she loves - it takes her some time - she is truly convincing. The same can be said about Dao Ming Si, whose candour as a besotted lover is quite endearing. Therefore, although I recognize this show is pretty cheap when it comes to costumes, screenshots, photography and overall acting, I still have a fond memory of it and will probably rewatch it in the future. I was hesitant about the overall score to give to this movie. I basically loved everything about it, from the plot to the acting to the execution. Possibly it deserves a 10, and I gave it a nine just to retain a right to a higher score in the future. I wasn't expecting anything less from the same screenwriter of Tatta Hitotsu No Koi, Sunao Ni Narenakute and Orange Days, nor from the same director of Winter Sonata, Sorry I love you and Bad Guy. They both did not disappoint. The script is delicate and moving. It touches deep chords in the hearts of anyone who has experienced the loss of a beloved one at least once. It talks about the fragile, magic relationship between the living and the deceased: how hard it is to let go, to overcome regrets and remorses while still keeping the memory alive. The photography is beautiful, it highlights that vague atmosphere constantly suspended between reality and fairy-tale. It helps that the two main leads are both beautiful to watch and just as convincing together. Hero Jaejoong might not be yet ready for complex line deliveries, but he's very expressive and, let's face it, a pleasure for the eyes. Han Hyo Joo, on the other hand is brilliant here, bringing up the joyful side this movie would otherwise lack. I think I've written enough. If you are willing to watch a movie which combines the Japanese delicacy and the Korean intensity of emotions, give this one a try. This is a very simple, almost mundane love story between a rich, spoiled girl and a poor but principled boy. Nothing new under the sun. And yet, it's a little story not easily forgotten, one I fell in love with at first sight and rewatched with equal pleasure. To me, Nao and Hiroto are an assumption, one of those couples I have stored away like a cameo. The progression of their love story is narrated with sweet candour, acted beautifully and without needless exaggerations. It's the first role I saw Kamenashi Kazuya working in and even though in the meantime he's matured, I still consider this to be his best interpretation. Ayase Haruka is so believable in her whimsical pouting one can't help becoming extremely fond of her too. And although the plot may seem ordinary, the small details of their interaction, the friendship, Hiroto's narration in first person, their young enthusiasm and depth of emotions are memorable. The music by Ike Yoshihiro is wonderful. Possibly the best drama original soundtrack ever. 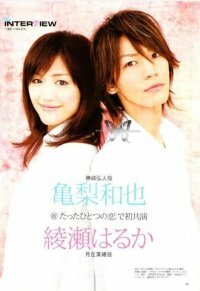 I recommend this dorama to those who still remember their first love and will relate to it, and to those who have forgotten it, as a mean to recall its bitter-sweet flavour. I have watched this drama... 4 times: no need to explain why I gave it a high re-watch mark. From what I've read around the web, this dorama didn't meet with a big success. I think the main reason is that it attracted the lovers of vampire stories but it didn't deal with vampirism in the traditional sense of the word. It defeated its own object. On the other hand, for someone like me who is only mildly interested in vampires and the whole sarg-sleeping, cross-shunning, blood-sucking process, this drama was a lot more enjoyable than I had expected. I liked the way the issue was approached, presenting the vampires as a decadent, declining, arrogant race who watches the humans with a mixture of desire and deep distaste, boarding on disgust. It makes it all the more touching when the cards are turned on the table and the one who thought himself superior is treated with contempt for his being different, a "monster". I confess at being invariably deeply affected by the issue "difference", and how people treat those who don't conform to the norm, either for their skin colour, their beliefs or lack thereof, their behaviour, their look. There are a couple of scenes in this dorama which are still vivid in my memory because they were intensely moving. They made me think once again of how cruel people can be when they ignore and how easy it is to be judged abnormal. So, although the acting is far from stellar and the plot at times inconsistent, I do believe this show deserves more attention than what it got. I watched this drama almost one year ago now and there\''s still a question lingering in my mind: what is it about? Does it tell the story of a girl who needs to come out of her hidden sense of guilt and find the lost relation to her father? Or is it about this same girl seeking revenge against a cheating boyfriend? Perhaps it tells the adventures of a young man who pretends he\''s gay, as the title seems to suggest. Or, again, it\''s the story of a house and how it influences the lives of those living in it. In short: I could compare this drama to a pot-pourri. You know, those pretty little boxes or vases filled with all sorts of dry flowers, herbs and spices. You open it thinking it will smell of frangipani and your nostrils are assailed by a nondescript cocktail of perfumes, from cinnamon to roses. The acting is not bad, although I maintain that Lee Min Ho is too preoccupied with his good looks to be a truly believable actor. I\''m ready to face the consequences of my statement. And, to be honest till the end, I was slightly distracted throughout the whole show by the length - or lack thereof - of his trousers. Overall, it starts in the best of ways, with elements of comedy and all the premises for a very sweet, passionate love story. It loses direction somewhere by the middle, and it doesn\''t find it back. And here we go again. I'd go as far as to say that any young actor who was once a student of Yankumi (Gokusen 1, 2 and 78) will sooner or later be involved in a love story with a more mature woman. It must be a karma thing. Nothing wrong with it, mind you. On the contrary, if a man is attracted to younger women, I don't see why it shouldn't be the same for a woman. And in many cases the formula works. Not here, though, not to me at least. Koike Teppei is the perfect child: he's sweet, invariably clumsy, funny in a goofy way, but he's the most unbelievable lover ever. I can imagine he could have a teen-ager crush on a tall, statuesque, perfectionist of a collegue but why should she reciprocate? To fullfill her mother instinct? This was the first time ever - and I hope the last - in which I laughed out loud during the first love declaration. The plot is so inconsistent I forgot most of it after watching the end credits. The situations these 2 are thrown into, which in the drama world should help the 2 fall in love with each other, are little, daily, mostly boring ones. I had no particular wish to know the epilogue of this story, so by the end I simply watched it while I did a dozen other things. How did it end, by the way? I forgot. I give the music a non-committal 5 because, truth be told, I don't remember how it was. Whatever the case, it certainly did not leave a great impression on me. Overall, a boring, dejÃ -vÃ¹ dorama with a very unfitting cast. This drama follows the Japanese "older woman-younger guy" trend. It seems as though every Japanese idol has to pass this test at least once in his acting career. Despite the premises though, there is something about this drama which made it into one of my favourites in its genre. Perhaps because on further analysis it doesn't deal with falling in love with someone, but with learning to love oneself and appreciate the little, daily things one gives for granted. Esumi Makiko is so beautiful here, one soon forgets the age gap. The story revolves around her, her internal struggle, her doubts, her self-esteem. Yamashita Tomohisa plays his part very well too, portraying a young man in that fragile phase between adolescence and adulthood in a very believable way. Overall, a delightful, suave drama.